Costa Rica is a beautiful destination that is more than recognizable for being full of surf camps and yoga retreats that manage to draw people in from a plethora of different countries around the world. With waves to match every skill level, it is easy to see why this special country has managed to attract the attention of surfers for decades, ranging from those who have never surfed before in their life and want to learn in a place with consistently rideable waves to experienced surfers who want to see what everyone is talking about. 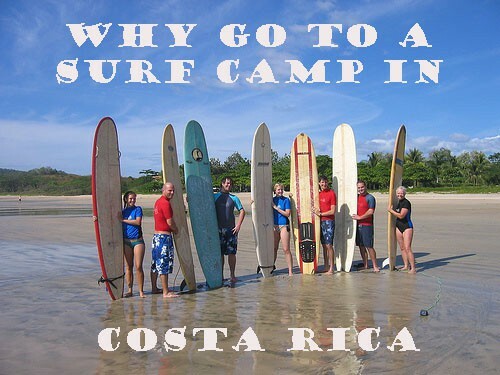 Today I am going to be taking a look at a few different reasons why going to a Costa Rica Surf Camp should be on your bucket list of adventures. I am also going to be exploring the topic of surf camps in general and the ways in which a surf camp adventure could positively affect you, not just as a surfer, but as a person. I think its is safe to say that the natural beauty of Costa Rica is what draws in thousands of avid surfers and travellers annually. There is no need for Instagram filters in this beautiful country, where waterfalls, palm trees and rainforests are a welcome escape from the concrete jungles that a lot of us are familiar with. As a surfer, you will naturally be drawn to the beaches, which are miles long and can be found scattered along both the Pacific and Caribbean coastline. Remember that Costa Rica is also home to some of the best yoga retreats in the world. That alone should tell you a lot about just how peaceful Costa Rica really is. It is a country that you can venture to and really start to find peace and enjoy life until you return to your normal surroundings. The fact that you will be surrounded by chilled out people and people who share your interests makes this all the more enticing. If you are already a avid surfer, then you will probably be able to imagine a picturesque “surf town” in your head without giving it much thought. You will be happy to hear that most of the surf camps in Costa Rica are in places that are similar to the one that you are imagining. As we have already mentioned, Costa Rica really is home to waves that match the skill levels and abilities of a range of different people. There are waves that are suitable for new surfers and waves that are only suitable for the most experienced surfers. The fact that there are hundreds of different beaches, reefs and points around Costa Rica means that there really is something for everyone. Most of the surf camps in Costa Rica are right on the water, meaning that you can easily get into and out of the sea as often as you might like to. One of the main benefits that comes with this is the fact that there are some unforgettable sunrises and sunsets to be seen off the coast, and the closeness of the sea will be enough to make even the laziest of sleepers get out of their bed and get in the water. Getting into and out of the ocean repeatedly might sound like quite the challenge. Getting into and back out of a wetsuit again and again, is something that no surfer should have to endure more than twice in one day. Luckily, surfing without a wetsuit is one of the advantages of learning to surf Costa Rica! One of my favorite things about getting people to go to a surf camp in Costa Rica is the fact that there is an awful lot to do when you are not out surfing. I would recommend that you try to get a group or at least a couple of people that you meet while you are there and head off exploring either the town or a natural park with them. As much as you might like to surf 24 hours a day 7 days a week, the stunning landscape around you will draw you in so much that you should take advantage of the time you are in Costa Rica. For example, You could head off on a jungle excursion to see some of the Costa Rica wildlife such as Howler Monkeys and Sloths, you could go on an adventure such as white water rafting or you could drift off somewhere to try some of the mouth-watering cuisine that foodies dream of. I would suggest that you work out exactly what you want to do because there is something for everyone in Costa Rica and if you are going to surf most of the time your free time will be somewhat limited. If you are an avid surfer, then you might be wondering why you should go to a surf camp at all? There are plenty of ways in which both experienced surfers and complete novices can benefit from attending going to a surf camp. When you attend a surf camp in Costa Rica, everything that you need is right on your doorstep. Most of the surf camps in Costa Rica give you access to all types of boards for as long as you are at the camp, meaning that you can surf as frequently as you want in order to work on what you are learning and you can test out different size boards from long boards to guns to without having to worry about the cost of renting different kinds of boards so you can see the difference between them all. If you are an experienced surfer, then you will probably want to take your own board on your trip with you but you can check out other boards while you are at the camp depending on how it looks that day. But, what else should you take with you? Simply put, you need to make sure that you pack your case the same way that you would pack for any surf trip, just in bulk. Make sure that you bring a few pairs of board shorts, a skin guard, some surf wax and plenty of waterproof sun screen. The basics such as the surf wax, sun screen, etc will be provided at the camps but its always good to bring your own. When going to a surf camp whether you are a beginner, intermediate or experienced, you can really benefit from proper instruction or tips from those that have surfed here all their lives or at least for a very long time. When you head off on a typical surf camp adventure, there are plenty of experienced people on hand who can give you the pointers and advice that you need to become a better surfer. Be that in the form of teaching you how to read the sea, or making tiny adjustments to make something that is already good even better. Most of the time, your surf camp instructors will give you demonstrations once or twice a day, there is usually a morning session and an afternoon session. If you already know what you want to get out of going to one these camps then you should tell them so that they can pave the way for you to achieve your goals. A lot of surf camp instructors also use video and photo analysis techniques so that they can spot where small things are going wrong. Learning to surf in Costa Rica or anyplace for that matter, is a massive confidence boost, especially when your instructors are just as stoked as you are. This confidence boost is one that will stay with you when you are back home, not just while you are in Costa Rica. A lot of people struggle when they surf Costa Rica as a beginner and in popular areas because of things like relatively crowded waves and reef breaks and before you take on these types of scenarios you need to get some experience and some confidence on a stick in order to tackle them. By going to a surf camp it will push your own comfort level not only in Costa Rica but when you return home. .
You might be wondering why you should go to a surf camp in Costa Rica instead of simply going and surfing on your own in Costa Rica. To put it simply, the locals have secrets and local knowledge that cannot be underestimated. When you are with those that have local knowledge it naturally a lot easier to find perfect waves when you are with people who know them like they are mapped out on the back of their hands. Just think of it as if someone came into your town and you had to show them the local places to go to. Alot of the best waves in Costa Rica have no names, meaning that you have to rely solely on local knowledge in order to find them. Your surf camp instructors will be more than happy to show you waves that are off of the beaten path in the little bit of paradise that is Costa Rica. Is Surf Camp Suitable for You? If you are a beginner, or someone who is returning to the waves after a few years out who just wants to make sure that they have all of the basic fundamentals covered, then you should expect to cover all of the basic surfing skills before you do anything else. Your surf camp instructors will teach you how to paddle, how to stand and how to turn. Standing might sound like the easiest task in the world, but standing on a surfboard for the first time is actually quite the challenge. Learning all of these physical motions is important, but your instructors will also teach you how to select a wave. This is something that can be difficult at first, but it becomes natural as you learn how to read the sea the way that an experienced surfer would. Remember that your gains will also be your instructors gains so you don’t need to be embarrassed if you don’t nail something on the first try. If you are already a keen surfer, then you will already have a firm grip when it comes to surfing basics. You should have some understanding of all of the elements that need to align in order to surf successfully. These include swell, direction, tide, wind, what time it is and even the current season. Your surf camp instructors will probably ask you questions in order to gauge how skilled you are. They might ask you whether or not you can catch waist high green waves on your own and whether or not you can surf frontside and backside. If you can do both of those things, then there will still be plenty for you to learn. For example, if you are not confident when it comes to head high waves, then your instructors will be able to work towards that goal with you. Remember that your instructors are there to help you. If you tell them what you are hoping to achieve, then they will help you to achieve it. If there is anything that you are uncomfortable doing, then you should tell them so that they can help make it more comfortable for you. Try to remember that this might involve pushing you out of your comfort zone, but that is never a bad thing. A typical day at surf camp can vary dramatically from camp to camp. For example, some of the surf camps in Costa Rica also offer a handful of yoga classes as part of your itinerary, meaning that you could go from surfing some wicked waves to finding inner peace. Chances are, you will get to choose exactly how many nights you want to stay at camp and I would recommend that you go for at least 3 or 4 days in order for what you learn to set in. Some surf camps in Costa Rica will allow you to customize your own surf schedule, which will give you the opportunity to check out the other activities going on at the camp, as even though surfing is main reason for being there, they usually have a whole bunch of other things going on while you are there. Some camps include all of your meals, while others put you up on a half-board basis. We would naturally advise that you get out and try some of the local (and delicious) cuisine. Surfing in both the morning and afternoon is perfect for beginners and experienced surfers. Most of the time, your instructor(s) will be ready to meet you in the morning for either a private lesson or a group session depending on what you signed up for. You should expect video footage to be taken and analysed later in the day or that night so you can see how you are doing. This is a good thing because it enables you to advance quickly, even if all you have to do is make a tiny adjustment to your stance. Naturally, you will have to take a break or two from being in the water and so you can spend some parts of your day relaxing. Most of the villas and properties that these camps are at offer beautiful views, colorful pools ( some even with swim up bars) hammocks to lounge around in and some of them will have night time activities or excursions to town. One of the main benefits of attending a surf camp as a solo traveler is the fact that they are completely safe and you don’t have to be concerned about surfing someplace that you may not be ready for. Also you will normally be in a group with several other people who learning how to surf or who are out getting a session in. In either case it makes surfing and meeting others much easier than it might otherwise would be. Most of the people who attend surf camp and are there by themselves and will be in the same situation as you and are also interested in making new friends in addition to learning how to surf. You also get a chance to commiserate with others as learning to surf can be frustrating at times and meeting others going through the same makes for a more enjoyable time. Who doesn’t like to learn new things with their close friends and family? Attending a surf camp as part of a group will enable everyone to learn something new and be able to talk about it for years to come once you get back home. Its also good if within this group there are surfers of all different skill levels. This way nobody has to feel like they are being held back or asked to surf waves that maybe they are not ready for yet . Also for those that have more experience they get a chance to surf with others that may be better then them and get a chance to learn a new trick or two since surfing with people who are better than you can help one to get better. Remember, none of us are born with both perfectly webbed feet and gills. Surfing is something that most people find difficult to start with and advancing can be quite troublesome at times. Just standing on a surf board is difficult to start with and those of us with some experience under our wetsuits often forget just how difficult and unnatural it is at the beginning. Surfing is something that takes a lot of dedication and attending a Costa Rica surf camp will show you just how dedicated and driven you can be. You will have the dedication needed to travel to a new and beautiful country to surf, the dedication to get up early in the morning to see the sunrise from the waves and the dedication to keep going. What more could one want?